To store or retrieve data from session state or application state variables, we use indexers. If you view the metadata of HttpSessionState class, you can see that there is an integral and string indexer defined. 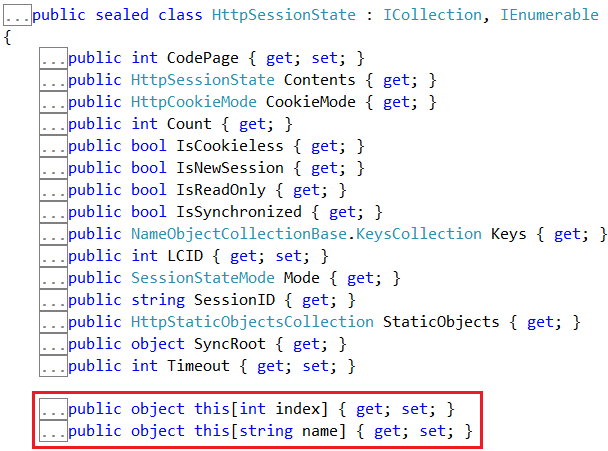 We use "this" keyword to create indexers in c#. We will discuss about creating indexers in our next video session. Another example of indexers usage in .NET. To retrieve data from a specific column when looping thru "SqlDataReader" object, we can use either the integral indexer or string indexer. 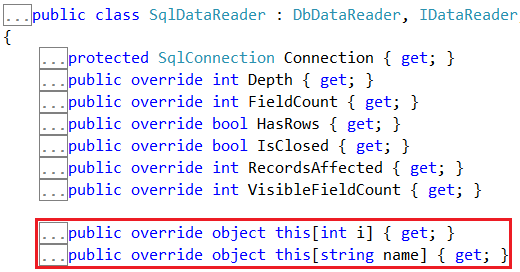 Right click on SqlDataReader class and select "Go To Definition", to view it's metadata. Notice that, there is an integral and string indexer defined. What are indexers in c#? From the above examples, it should be clear that, Indexers allow instances of a class to be indexed just like arrays. In our next video, we will discuss about creating indexers. Before these videos , programming was very hard to learn for me. These videos makes it easy and now programming is very simple task for me.